Saudi Gazette columnist Mohammed Azhar Ali Khan accuses Point de Bascule of lying about Human Concern International’s sponsorship of events (featuring radical preachers). Really? In June 2015, the Saudi Gazette published three articles (June 5 – June 19 – June 26) by its Ottawa-based columnist Mohammed Azhar Ali Khan against Point de Bascule. In the June 19 article, Mr. Ali Khan wrote that Point de Bascule’s assertion to the effect that Human Concern International (HCI) had sponsored events featuring radical speakers is false and that Point de Bascule is lying. HCI is a registered charity that was established in Calgary before moving to Ottawa. Its file can be accessed on the Canada Revenue Agency’s website (File 107497125RR0001). In what follows, Point de Bascule refutes Mohammed Azhar Ali Khan by listing four events that were sponsored by Human Concern International in the past. The first two were mentioned in a 2014 article that Point de Bascule dedicated to Mr. Ali Khan himself: New MCCNCR president Mohammed Azhar Ali Khan presents his organization as primary Muslim contact for police and other government agencies in Ottawa. Mohammed Azhar Ali Khan was born in India in 1932 and moved to Pakistan in 1950, three years after the partition of India. After studying in the United States and working as a news editor for a Pakistani newspaper and a correspondent for two American newspapers, he migrated to Ottawa in 1965. Shortly after his arrival, he started working as a journalist for the Ottawa Citizen and became a member of its editorial board in 1967. He resigned his position in 1990 to become director of multiculturalism and senior policy adviser with the Citizens’ Forum on Canada’s Future, usually referred to as the Spicer Commission. After the failure of the Meech Lake accord, Prime Minister Brian Mulroney had asked former Ottawa Citizen editor Keith Spicer to take the pulse of Canadians about the political future of the country. From 1996 to 2006, Mohammed Azhar Ali Khan was an Immigration and Refugee Board adjudicator (“refugee judge”). 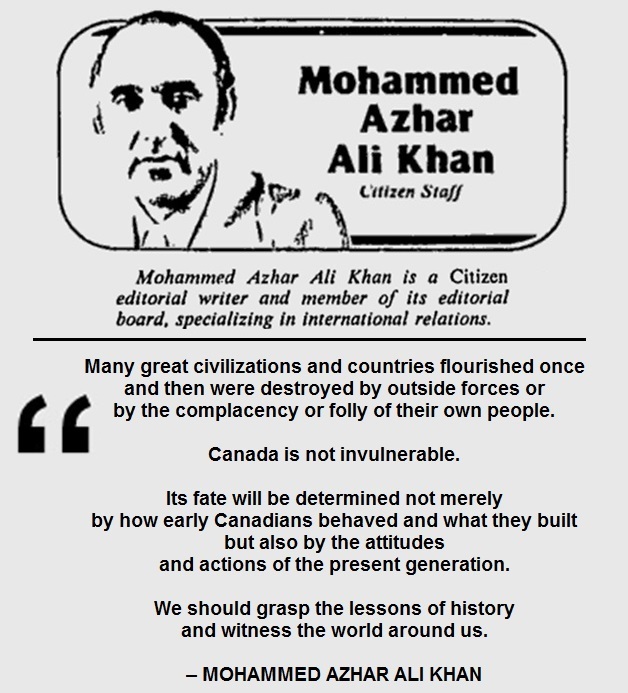 In the eighties, Ali Khan led the Ottawa Muslim Association. In 2007, he started the Muslim Coordinating Council of the National Capital Region (MCCNCR), an umbrella organization in Ottawa, and he was its president until 2010. On February 13, 2014, Ali Khan was officially chosen as MCCNCR president for a second time. Mohammed Azhar Ali Khan has also been a member of Human Concern International’s Board: 2008 – 2009 – 2010 – 2011 – 2012. In the past, many mainstream Muslim organizations have misled police and other government organizations about the nature of the Islamist threat facing us (about the nature of the concept “jihad,” for example). Since Mr. Ali Khan aspired to be a contact person for government agencies (including police, of course), it was only natural to try figuring out what kind of advice he would be giving. After finding out that he had been on the Board of Human Concern International for several years, we noticed that in 2008 and 2012, during his mandate on HCI’s Board, his organization sponsored two events where radical speakers had been invited. In his June 19 Saudi Gazette column / Archive.Today, Mr. Ali Khan denied that HCI has ever sponsored events but the proofs are there: the webpages or the posters dedicated to these events by those who organize them are still accessible on the web. The program of the Islamic Society of North America’s 34th Convention (Look for sessions 7 & 10) announces that Qazi Hussein Ahmad (1938-2013), the leader of the Pakistani Jamaat-e-Islami (JEI) in 2008, was scheduled as one of the main speakers at the event. The JEI is an arch-radical organization that was founded in 1941 by Syed Maududi in British India. Maududi moved to Pakistan after partition. According to the Canada Revenue Agency, an armed wing of the JEI is waging armed jihad in India. JEI has very close links with the Muslim Brotherhood. In 1996, the Globe and Mail reported that, when HCI representative in Pakistan and al-Qaeda leader Ahmed Said Khadr was arrested in relation with the bombing at the Egyptian embassy in Islamabad that killed 16 people and injured 60, the Jamaat-e-Islami provided him legal counsel. According to a report that was published by the Global Muslim Brotherhood Daily Watch around the time of ISNA’s 2008 convention, Canadian authorities refused to grant JEI leader Qazi Hussein Ahmad a visa. In 2013, the ISNA Development Foundation (IDF), a substructure of ISNA, the organizer of the 2008 convention, had its charitable status revoked after the Canada Revenue Agency concluded that IDF provided tax receipts to a second entity (Kashmiri Canadian Council/Kashmiri Relief Fund of Canada) that transferred funds to a third entity (Relief Organization for Kashmiri Muslims), a charitable arm of the Jamaat-e-Islami (JEI). JEI’s armed wing (Hizbul Mujahideen) is engaged in jihad against India. All this information is mentioned in the Summary of reasons for revocation that was issued by the Canada Revenue Agency after IDF’s charitable status was revoked. The program of ISNA’s 34th Convention featuring Qazi Hussein Ahmad as speaker is available HERE (also Archive.Today). Ahmad’s name can be found at Session 7 and Session 10 in the program. 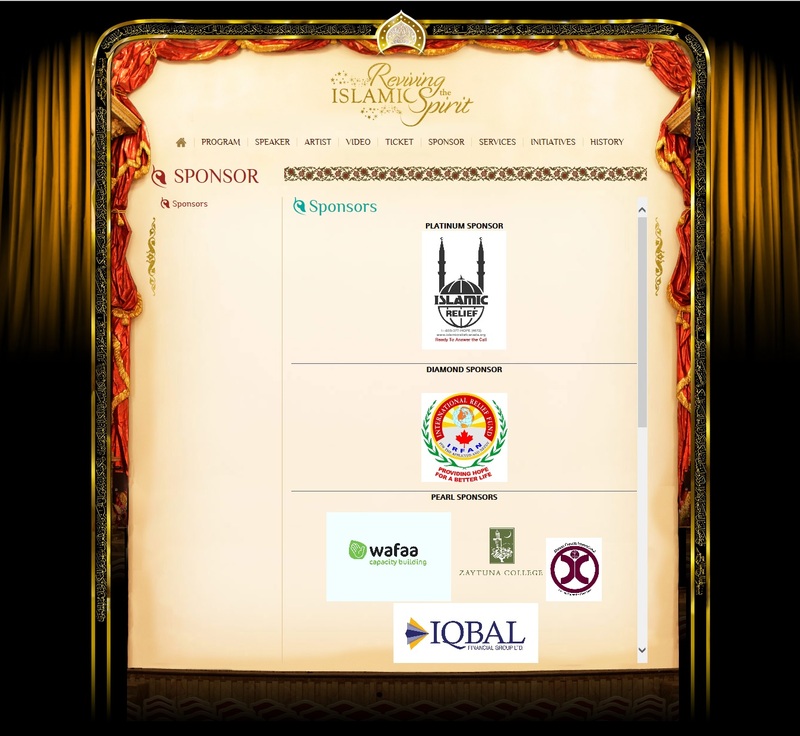 The mention of HCI’s sponsorship of ISNA’s 34th Convention is available HERE (also Archive.Today). The second example of events sponsored by HCI that Point de Bascule presented in the 2014 article dedicated to Mohammed Azhar Ali Khan is the Reviving the Islamic Spirit (RIS) convention in 2012. Aside from a RIS 2012 webpage presenting Human Concern International as a Pearl sponsor of the event, there is also a mention of HCI’s sponsorship of the convention in a press release / Archive.Today that was issued by the National Council of Canadian Muslims (then called CAIR-CAN) in December 2012. Mr. Ali Khan and the NCCM are close allies. In 2013, he spoke at a press conference / Archive.Today that was organized by CAIR-CAN / NCCM in Ottawa. The 2012 edition of the RIS convention had a large media coverage. For two reasons: first, Justin Trudeau, then a candidate for the leadership of the Liberal Party, accepted to speak at the event, and second, IRFAN-Canada, an organization whose charitable status had been revoked the year before for having transferred almost $15 million to the terrorist entity Hamas sponsored the event. IRFAN eventually cancelled its sponsorship of the event after Point de Bascule highlighted its links with the terrorist organization Hamas and mainstream media covered the story. In 2014, IRFAN-Canada itself was added to Canada’s list of banned terrorist organizations. A research published by the Canada Revenue Agency explains in details the links between IRFAN-Canada and Hamas: IRFAN-Canada – Links to Hamas / Archives PdeB. ABDALLAH BIN BAYYAH: He recommended using charitable donations to fund terrorism. MUSTAFA CERIC: In 2010, the Pakistani Daily Mail reported that “Dr. Mustafa Ceric urged the Muslim Ummah [community] to conquer the world through Halal movement” at the Global Halal Congress in Karachi (also GMBDW). JAMAL BADAWI: In an interview given in the early 2000s, he advocated that Muslims should become judges in North America and take advantage of their influential positions in order to stop applying current legal provisions that are incompatible with sharia. Does Mohammed Azhar Ali Khan consider HCI representative Jamal Badawi an “Islamophobe” for agreeing with Point de Bascule on the goal that he and his allies are pursuing? In a 2004 interview with Egypt Today, Ramadan encouraged Islamists operating in Canada to use the Canadian legal framework, which he described as “one of the most open in the world,” to subtly and gradually introduce rules of sharia in Canada. At the time, Tariq Ramadan strongly urged his supporters in Canada not to openly mention their commitment to sharia: “The term shariah in itself is laden with negative connotations in the Western mind,” Ramadan said. “There is no need to stress that. […] For the time being this is not how we want to be perceived,” he added. In his June 19 article, Mohammed Azhar Ali Khan stated that “It is idiotic to say that a minority can think of imposing Shariah on a non-Muslim majority even if they wanted to, which they don’t.” Once more Mr. Ali Khan has been proven wrong. The preceding quotes by Ceric, Badawi and Ramadan, all influential mainstream Muslim leaders, are there to prove that the project of progressively implementing sharia in the West is very real and that those saying otherwise are either incompetent or deceiving us. Already in 1975, Saudi agent Jaafar Idris was advocating the gradual “Islamization” of the North American society (Part 1 – Part 8) in front of North American leaders of the Muslim Students’ Association in Toledo (Ohio). ABDALLAH IDRIS ALI: He was listed as Secretary General of ISNA Development Foundation in the last financial statement that was produced before the organization’s charitable status was revoked by the Canada Revenue Agency for its involvement in the funding of an organization linked to terrorism. HAMZA YUSUF: The organizers of the RIS 2014 convention tweeted the following excerpt of Hamza Yusuf’s speech at last year’s convention: “When you are powerless, non-violence is the best way to approach your enemies.” Youssef Qaradawi, the Muslim Brotherhood spiritual guide, whom Yusuf describes as the “eminent” friend and colleague of his “teacher” Abdullah Bin Bayyah presented the corollary to Yusuf’s proposal in his book Priorities when he stated that one “of the political principles brought to this earth by Islam” is “changing wrong by force whenever possible,” wrong being what is opposed to sharia, of course. More information is available on Point de Bascule about the speakers and the sponsors of the RIS 2012 convention and about other editions of the conference that is organized on a yearly basis in Toronto at Christmas time. The mention of HCI as a Pearl sponsor of the RIS 2012 convention can be seen HERE (also Archive.Today – Point de Bascule). 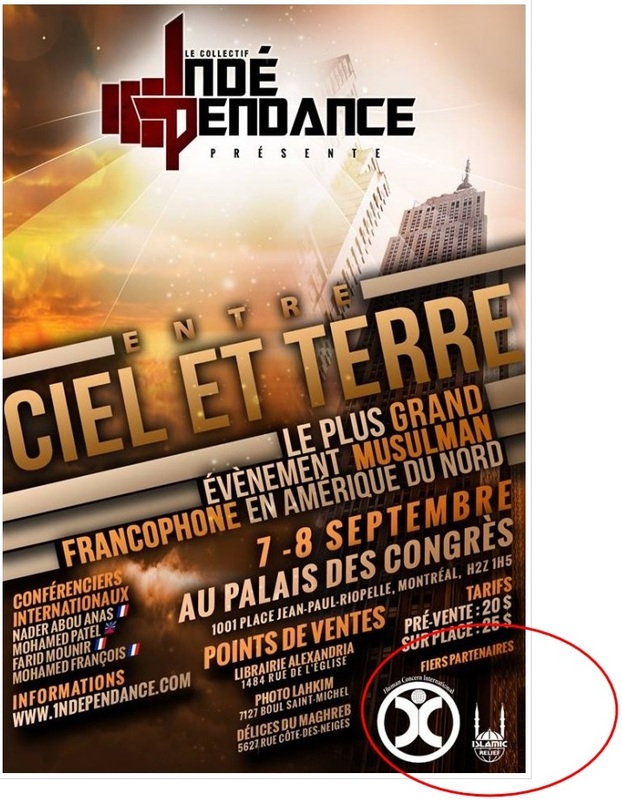 The mention of HCI as a partner of the 1ndépendance 2013 convention can be seen HERE (also Archive.Today – Point de Bascule). 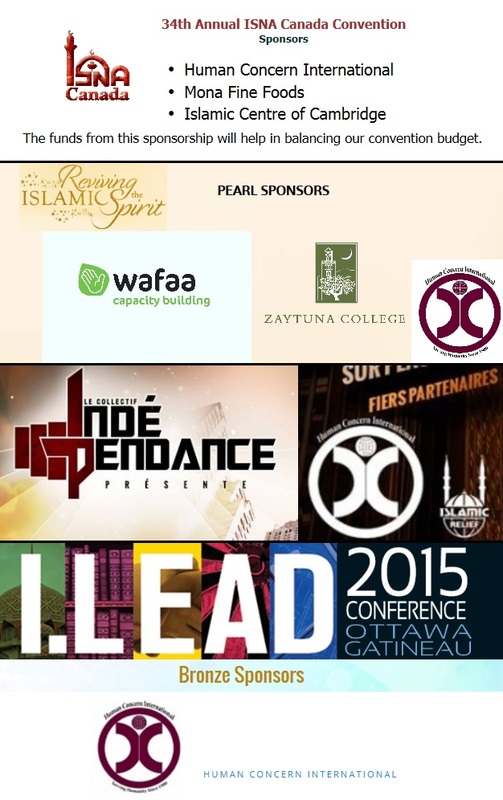 In March 2015, HCI sponsored the ILEAD 2015 convention in Gatineau QC, near Ottawa. Ingrid Mattson, Yahya Michot and Faisal Kutty were among the speakers. INGRID MATTSON: In 2001, shortly after the 9/11 attacks, Ingrid Mattson defended Wahhabism in a CNN chat room, and presented it as a movement “analogous to the European protestant reformation.” The 2007 NYPD report Radicalization in the West (page 17) stresses that Wahhabism is based on an “extreme intolerance and hostility towards unbelievers, including Jews, Christians, Hindus and Shiites,” and that “It provides the primary theological foundation for jihadi-Salafi causes and reduces the barriers to violence.” The NYPD report adds that “Contemporary Saudi (Wahhabi) scholars have provided the religious legitimacy for many of the arguments promoted by the jihadists”. In the audit that led to the revocation of the Saudi World Assembly of Muslim Youth’s charitable status for its funding of Al Qaeda, the Canada Revenue Agency addressed the issue of terrorism funding by Saudi Wahhabi organizations. YAHYA MICHOT: In 1997, a few weeks after the murder of seven Christian monks in Algeria by the GIA (Armed Islamic Group), Yahya Michot translated, commented and published a fatwa originally written by Muslim scholar Ibn Taymiyya (1263-1328) that justifies the killing of Christian monks. Ibn Taymiyya considered that Christian monks who do not live secluded and maintain contacts with Muslims living close to their monasteries are “Imams of unbelief” guilty of leading Muslims away from “the true religion,” and who deserved to be killed. Michot published his translation under a pseudonym. After his identity was revealed, Yahya Michot withdrew copies of his booklet still unsold from circulation. He later republished the French translation of Ibn Taymiyya’s fatwa without linking it to the 1996 murders of monks in Algeria the second time. The mention of HCI as a Bronze sponsor of the ILEAD 2015 convention can be seen HERE (also WebArchive – Archive.Today). He is wrong on both counts. 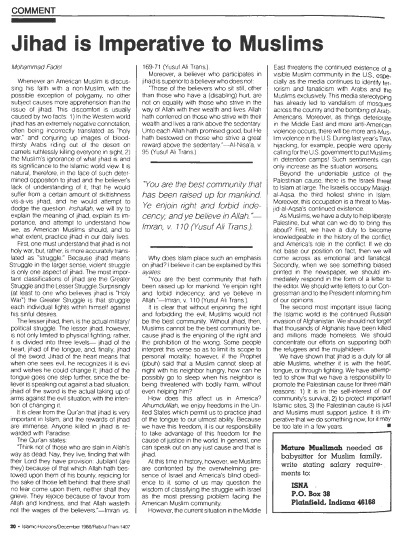 Already in December 2012, after being condemned by the National Council of Canadian Muslims (then called CAIR-CAN) for the same choice of word, Point de Bascule explained that the term ‘Islamist’ is used to designate Muslims who are engaged in a political struggle to impose their totalitarian doctrine (Tariq Ramadan prefers the expression “all-encompassing doctrine”), to help distinguish these Muslims from other Muslims who do not share their objective. MB memorandum / Point 4 – The Ikhwan [Muslim Brotherhood] must understand that their work in America is a kind of grand Jihad in eliminating and destroying the Western civilization from within and “sabotaging” its miserable house by their hands and the hands of the believers so that it is eliminated and God’s religion is made victorious over all other religions. Islamists themselves use frequently the word “Islamist.” When they do, it has a positive connotation. Faisal Kutty / Archive.Today (in 1998) and Tariq Ramadan / Archive.Today (in 2012) used the word “Islamist” to describe in a positive manner Mahfoud Nahna, an Algerian Muslim Brotherhood leader. Kutty dedicated an article to Nahna that was entitled Algerian Islamist Sheikh Mahfoud Nahna addresses ISNA conference / WebArchive – Archive.Today. Who would object to that? Qaradawi, himself, used the word “Islamist” to describe his ally Hassan Turabi (search Dr. Hassan) in his classic Priorities of the Islamic movement in the coming phase based on a speech that he gave in Algeria in 1990. Words have meaning and nuances are important. The reasons that led Kutty, Abu-Rabi and Ramadan to use the word “Islamist” are the reasons that lead Point de Bascule to do it. A quest for precision and nuance. By using the word “Islamist,” Kutty, Ramadan and Abu-Rabi all agreed implicitly that not all Muslims support sharia. 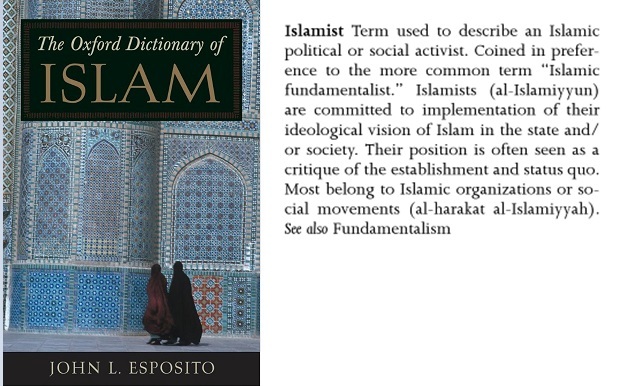 They needed a word to distinguish Muslim activists who support sharia and work to implement it from the other Muslims. At one point, somebody came up with the word Islamist. It serves the purpose. We could not have come up with a better definition, so we adopted it. Mohammed Azhar Ali Khan started his June 19 article by highlighting that he was motivated by accuracy, fairness and truth. We did our part. We demonstrated that Human Concern International sponsored several events featuring Islamist preachers, contrary to what he claimed in his Saudi paper. Nothing could further from the truth. The articles that we produce are about influential leaders and organizations, not about Muslims in general. We produced our March 2014 article after Mohammed Azhar Ali Khan became president of the Muslim Coordinating Council, after he presented his organization as primary Muslim contact for government agencies (including police) in Ottawa. Western governments are constantly being misled on the nature of the Islamist threat by people who claim to be the spokespersons of the Muslim community. This is why it is so important to know the ideological background of those who are involved in outreach activities with police. In the UK, the Islamists convinced the government that as long as Islamists do not openly advocate violence, they can be relied upon to stop those who advocate violence. This led to the Radical Middle Way initiative. It was a failure. The threat facing us is not limited to violence. It includes all those who work at implementing their sharia-based totalitarian ideology, whether they practice armed jihad or the “jihad of the tongue” (click on the image). In Canada, Islamists told police that jihad has basically nothing to do with violence, while there are hundreds of books endorsed by the same Islamists that state the opposite. In the U.S. and in Canada, Muslim advisors to government agencies have been successful at convincing their counterparts that the ideology of the jihadists should not be analyzed. It would be “Islamophobic,” they claim. In any war, in order to defeat the enemy, a key rule to follow is to be well aware of the enemy’s objectives and motivations. Forbidding all allusions to Islam and its principles leads to prohibiting the required study and analysis of texts and speeches made by those who threaten us. This in turn, prevents the understanding of their objectives and how they intend to achieve them. As Stephen Coughlin, a former Pentagon advisor now with the Washington-based Center for Security Policy explained (VIDEO 2:34), even if the enemy has a wrong understanding of Islam, it is still using it to threaten us. In these circumstances, for our own protection, it is crucial to master its doctrine, its understanding of Islam. In a second phase, it is important to evaluate how widespread is this interpretation of Islam in order to determine the magnitude of the threat. This is what motivates us when we try to understand the ideological background and the organizational links of those who advise police.